The TC Electronic Crescendo Auto Swell Guitar Effects Pedal handles volume swell, so that you don't have to. The unique character of this effect harnesses the "swell" effect often associated with bowed instruments, and offers it to guitarists in this affordable compact - rather than having to fork out for a vintage pedal that will set you back considerably more. 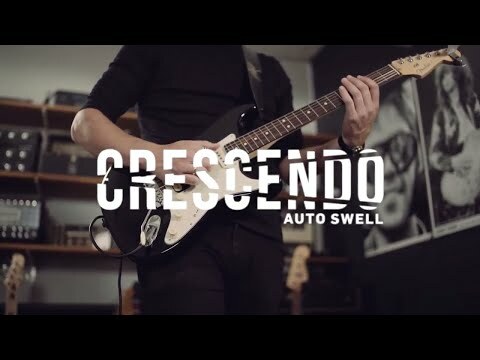 The TC Electronic Crescendo Auto Swell Guitar Effects Pedal sounds like you're riding your volume pedal or volume pot on your guitar, but takes the effort out of it for you. You can incorporate different effects or techniques alongside the Crescendo Auto Swell to expand your tonal arsenal and creative potential even further. The dual knob layout consists of a Sensitivity, and an Attack pot that offers highly simplified control that produces remarkably sophisticated results. The Sensitivity control attenuates the sensitivity at which your picking dynamics engage the effect. Keep it low for rapid-fire staccato effects, or high for a much wider sweep. The Attack control adjusts how quickly the effect "swells" the volume of the input signal. Between the two, you'll be astounded by how much control is at your disposal. The TC Electronic Crescendo Auto Swell Guitar Effects Pedal is built to exceed the demands of today's guitarists. Whether you're simply jamming at home, taking to the stage, or hitting the road on a lengthy tour, this little beauty is built to take anything that you throw at it. Thanks to its pedalboard-friendly design, this little beauty will slip into the busiest of setups with ease. As we've come to expect from the team at TC Electronic, the pedal is equipped with their high quality true bypass circuitry. Therefore, when you're not using the pedal, your dry tone remains unblemished. The pedal can be powered either by 9-Volt battery or optional 9-Volt power supply unit, enabling you to stay powered up wherever you are.